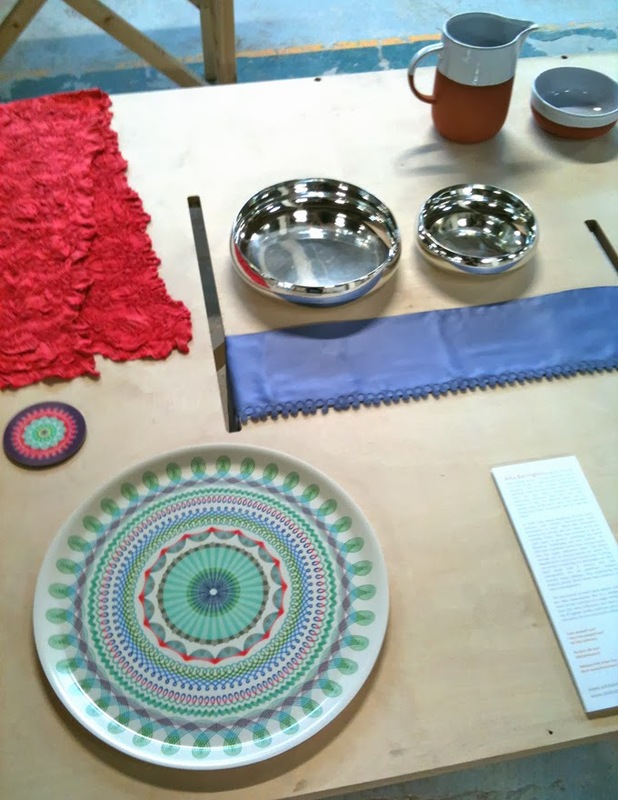 Even though there are no Alabasta ceramics in production quite yet, some of my placemat and tray designs sneaked into the prestigious British Ceramics Biennal in Stoke on Trent last week. I have been a member of Contemporary Applied Arts in London for many years selling my own label handmade cashmere and silk hand dyed scarves through this lovely outlet. As Alabasta has developed and as I have been getting more and more pregnant I have been making less scarves but CAA is still the place to go to for the best selection. Last year I participated in DomesticMatters at the CAA (see this post), which was all about members of CAA who also diversify into production runs of other related products. 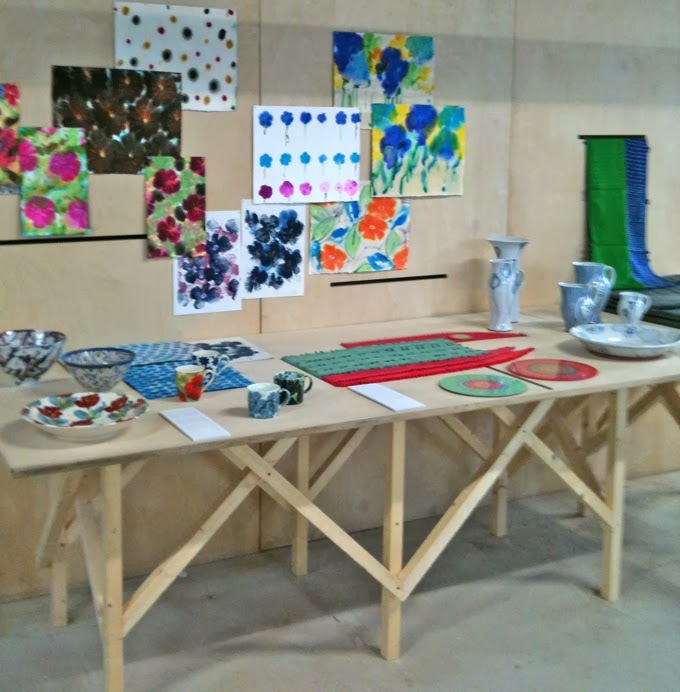 This latest show, also curated by Brian Kennedy with homeware design consultant and ceramic designer Sue Pryke shows a mixture of textiles, surface pattern and glass alongside contemporary ceramics from well known potters such as Andrew Wicks and Natasha Daintry. "CRAFT INTO INDUSTRY examines the possible relationship between British studio practice and the ceramics industry. Sue Pryke and Brian Kennedy were keen to not only look at ceramicists for this exhibition but to explore and present makers from a wide range of disciplines as they strongly feel that there are many partnership possibilities between studio practitioners and the British ceramics industry. Including work by Asta Barrington, Heather Belcher, Elizabeth Bone, Daphne Carnegy, Carina Ciscato, Natasha Daintry, Ekta Kaul, Sarah Kay, Chris Keenan, Sun Kim, Billy Lloyd, Grant McCaig, Nick Membery, Sue Paraskeva, Michael Ruh, Vicky Shaw, Janice Tchalenko, Sasha Wardell, Andrew Wicks, Derek Wilson and Sue Pryke." The look of the exhibition is quite 'raw' because it is taking place at the Original Spode factory so is surrounded by the atmospheric and possibly rather dusty debris from the workings of an old pottery! Alabasta Folk Stripe placemats and coaster shown with Asta Barrington scarves plus Janice Tchalenko ceramics on their left and surface pattern on the walls. All photos by Brian Kennedy. 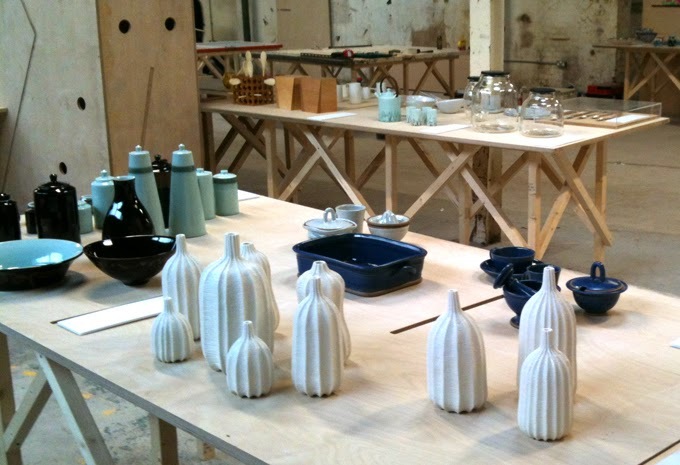 CRAFT INTO INDUSTRY is now open at the British Ceramics Biennial until 10th November 2013. The exhibition will be moved to London next year as part of the Contemporary Applied Art 2014 exhibition programme and installed in their brand new gallery in Southwark.